For easy transport of metal barriers against crowds with 19 or 9 bars. For transport and storing of 28 mobile fences of the M100, M200, M300 and M500 types in a vertical position. You make fence removal practically impossible by installing barbed wire. Steel galvanized replacement of standard foots. A special clamp for clamping fence with gate construction. All-purpose steel clamp for connection of two fence panels. Excellent foot and easy manipulation. A full-colour advertising banner designed to make publicity to your company, your customers, an event, a site or requirements. 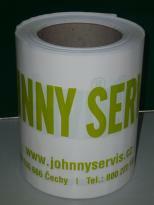 Films in rolls of 50m length, available in different colours and qualities. For transport and storing of all mobile fences in vertical position. For transport and storing of all mobile fences in horizontal position. For transport and storing of 28 mobile fences of the M90 type in a vertical position. Steel frame for anchoring without steel peg. A device preventing lifting makes elevation of the fence impossible. All-purpose SAFETY steel clamp with a special key. To secure mobile fencing at road barriers. Fixed, reinforced and stable foot, weight 36 kg.